A truly charming contemporary mediterranean style two storey villa for sale, on a double plot within the Altos de Valderrama gated area within Sotogrande Alto. 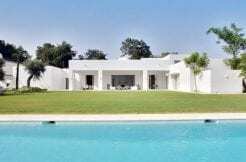 An extremely charming villa with 7 bedrooms (including staff quarters) in the Valderrama area of Sotogrande Alto. The property, which is contemporary Mediterranean in style, is in immaculate condition and enjoys the peace of mind and tranquillity of being in the Altos de Valderrama gated community. Arrival is through an airy double height entrance hall which leads to a living room, wonderful Mediterranean kitchen with utility area and adjoining staff en suite room. On this same floor there is the first master section with en suite bedroom and study, all with french door access to the garden or a patio, and 2 further en suite bedrooms. Upstairs there is a lounge with fireplace and terrace, another master section with dressing area and bathroom and 2 further bedroom suites. The garden is reminiscent of being in an English country house full of flowers, very private and with a large pool and adjoining pool caseta.